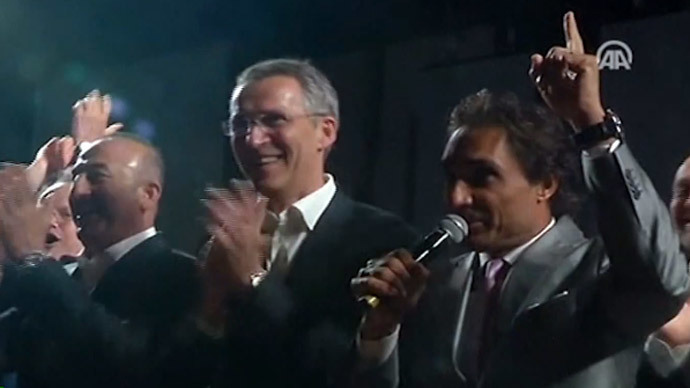 NATO foreign ministers got their rocks off and sang karaoke at the end of a meeting in Antalya, Turkey. Perhaps the song choice - “We Are The World” – was poor though. They got roasted on social media for their perceived peace-promoting hypocrisy. Since the millennium, the military alliance’s troops have been involved in wars in Afghanistan, Iraq and Libya, which has seen many thousands die in the conflicts. NATO has also used drone campaigns and bombing raids in its war on terror. Those taking to social media certainly made their feelings known about NATO’s performance, with the words “warmongers” and “killers” used regularly. @HDNER The war mongers, the killers of Afghanistan and Libya, the civil war creators in Ukraine, so where is that PEACE coming in? Some said it would at least be better if NATO stuck to “singing instead of their usual bombing” campaigns. NATO officials were in the Turkish city of Antalya for a meeting held by the military alliance. After the convention came to its conclusion, a few decided to get on stage. They let their hair down and cranked up their vocal chords. The foreign ministers of Greece and Turkey, Mevlut Cavusoglu and Nikos Kotzias, were in the thick of the action, as they took to the microphones and began swaying arm in arm to the tune. The NATO Secretary-General Jens Stoltenberg was certainly not going to miss out and made his move on to the stage before joining arms with the EU Foreign Policy Chief Federica Mogherini. ‘We Are The World’ was written by Michael Jackson and Lionel Richie in 1985 and was sung by the supergroup USA for Africa, which helped raise $6.5 million in just two months for those stricken by famine. @APDiploWriter Translation to Putin. We surrender. @APDiploWriter It suppose it's better than NATO war mongers singing : "We are the Champions"?